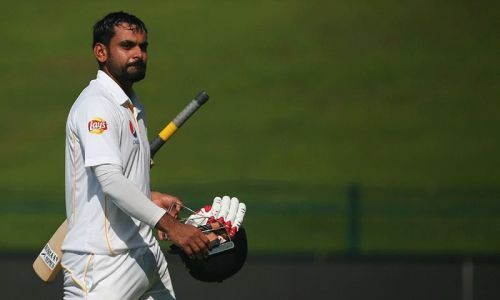 Pakistan veteran all-rounder Mohammad Hafeez has decided to retire from Test matches after the ongoing Test match against New Zealand played at Abu Dhabi. He has been struggling with form of late. He made a comeback in the Test series against Australia and scored a brilliant 126 in the first Test match at Dubai played in October this year. Since then, he has been struggling with form. He scored 17, 4, and 6 in his next three innings against Australia. In the ongoing Test series against New Zealand, Hafeez has continued to struggle, with scores of 20, 10, 9, and 0. His lack of form has haunted the Pakistan side, and he has also been struggling for form with the ball. Hafeez made his Test debut for Pakistan against Bangladesh in 2003 and played a total of 54 Test matches (103 innings) and scored 3644 runs with an average of 38.35. His best score in Test cricket is 224. With ongoing series placed at 1-1, Hafeez was dismissed by Trent Boult at Abu Dhabi. With the tour of South Africa about to start, the challenge for inexperienced batting line up against top quality bowling line up would be a difficult one. Hafeez has decided to focus on the limited overs version. He made his ODI debut for Pakistan against Zimbabwe in 2003 and has played 203 matches (202 innings) and scored 6153 runs, with a personal best score of 140 not out. With the World Cup 2019 coming up, Hafeez will play a crucial role for Pakistan team with the bat and also with ball. He played a key role in Pakistan's whitewash wins over Australia and New Zealand during the T20I series at the UAE. Hafeez has played 89 matches (67 innings) and scored 1908 runs, with a best score of 86. Hafeez is a decent bowler in the ODI and T20I formats. He has taken 137 wickets from 203 ODIs ( 202 innings) at an economy of 4.10 runs per over. In T20I format, Hafeez has taken 54 wickets from 89 matches(67 innings) with best figures of 4/10 at an economy of 6.58 runs per over.